As usual do note these are wholesale prices for freshly cut mistletoe – the retail price will be much higher as the material needs to be sorted, a lot of it discarded (there’s a lot of waste in mistletoe!) and the best bits trimmed and prepared for sale. The retail price will largely reflect the time taken to do all that. Mistletoe berries need bees – a fact that’s often overlooked when people talk about the ‘crop’. They interpret berry numbers as being a function of the recent summer or autumn weather, and barely give a thought to their real origin – from flowers that need to be pollinated. Flowers that open in February. And need to be pollinated by insects – bees especially. It’s the amount of pollination that determines the number of berries – and that depends on bees and other insects in February. This comes up again and again when I give talks on mistletoe – which I’ve been doing a lot recently – when I explain how slow-growing mistletoe is; the flower buds slowly developing in the year before, opening in February and, if pollinated, developing oh so slowly over 10-12 months to produce mature berries. By which time there are new flower buds ready for the new season. Berries may be a year old before they are fully ripe. Getting back to the bees I was pleased to see the Friends of the Earth ‘Christmas Bee Saver Kit’ yesterday – which they’ll send you in return for a donation. Why pleased? Because it features a picture of mistletoe complete with mistletoe flower buds, right next to a bee. It just seemed a nice touch. Whether it is deliberate (with FoE knowing their mistletoe biology) or just an accident of a Christmas-themed design (with FoE just commissioning a seasonal design) I don’t know. But I like it either way. As part of the Tenbury Wells Mistletoe Festival 2018 a new children’s book, The Kissing Tree, has been published, written by local author Helen Wendy Cooper. It is part of the Tenbury Mistletoe Association’s promotions this season. The story centres on Jack the Jackdaw who is searching for the perfect tree for mistletoe to grow on – but is thwarted by a Robin that eats all his mistletoe berries. An imaginative and educational book for children, showing how mistletoe needs a tree to grow on and that berries/seeds are spread by birds. So far so good. My only complaint, which mistletoe advocates may well have anticipated already, is that neither Jackdaws or Robins generally eat mistletoe berries! Now if it had been “Mike the Mistle Thrush” being thwarted by a mischievous Blackcap that would have been fine. And even appropriate, as Blackcaps ARE usurping Mistle Thrushes as distributors of mistletoe. So there is a real life story that could be referenced here. So, educational in telling how mistletoe grows on trees and is spread by birds, but, sadly, suggesting entirely the wrong birds. In previous years I’ve reported on the 6 mistletoe insects we have in Britain – and how we know very little about them. Indeed 2 of the 6 were only discovered here in the years since 2000 and the distribution and biology of all 6 are hardly known. But all are definitely tied to mistletoe, as they eat nothing else (except the Anthocoris bug, which eats the others). The weevil lays its eggs inside mistletoe stems and the larva develops inside, only emerging as an adult weevil and leaving a distinctive exit hole. Affected shoots often show die-back of the terminal bud. And that’s about all that is known about it. A simple life-cycle, no complications. Or none known. However, a recent paper by Ian Thompson and Godfrey Blunt in Field Studies journal recording studies of invertebrate communities in Shropshire orchards makes an intriguing observation. The authors made a special effort to record mistletoe insects within the orchards they visited, including collecting some mistletoe shoots with bud die-back to see if weevils emerged. Some weevils did indeed emerge from some of the samples. But from others a tiny parasitic wasp emerged instead of the weevil. It was from a genus of wasps, Triaspis, that specialises in parasitising the eggs and larvae of beetles. The obvious inference is that this wasp was parasitising the Mistletoe Weevil larvae. The wasp proved impossible to identify to species – and so may, itself, be newly discovered and might, perhaps, be a dedicated specialist only parasitising the Mistletoe Weevil. Which only eats mistletoe, itself a parasite. So we could have a new species and a new parasite – of an insect that eats a parasite. The first of this season’s mistletoe auctions is happening on Tuesday morning – and I’m guessing that a lot of stock has already arrived on site, with more coming tomorrow. This is ‘proper’ traditional mistletoe, gathered from the old apple orchards across Herefordshire, Worcestershire and Gloucestershire. If you want to attend you’ll need to be at Burford House Garden Stores, Burford, Tenbury Wells, WR15 8HQ on Tuesday morning. And you’ll have another chance on the following two Tuesdays. This traditional mistletoe is, of course, the mistletoe species native to northern Europe, and the only species we have in Britain. 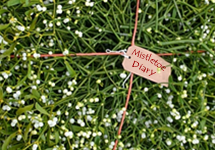 It is the origin of all those myths and legends about mistletoe and the true mistletoe of Christmas kissing. But there are many other mistletoes around – and in places where they don’t have Viscum album, other mistletoe species are substituted at Christmas. It’s arguably cheating, as it is our species that the kissing tradition belongs too, but it’s fun – and why not consider all mistletoes as kissing plants? The harvest of these other mistletoes is also underway – particularly, as usual, in Texas where the Phoradendron mistletoes take the place of Viscum album, growing on Mesquite trees instead on Apple. Texas has a long tradition of sending its mistletoe across the USA and every year there are stories about the harvest and how it’s looking. Mistletoe ‘crop’ 2018 – looking good, ripening early? Almost November, so time to look at how mistletoe is looking for Christmas this year. And, again (this is several years in a row now) it’s looking fairly good. The female plants I’ve looked at are festooned with berries and it would seem we have yet another ‘bumper crop’. Of course it’s not a crop, not in the conventional sense of something grown for harvest, as most simply grows where it wants to and isn’t actively encouraged. But in areas and habitats where it grows well – primarily the SW midlands in mature (often over-mature) apple orchards – it can seem like a crop, and certainly can be harvested like one. One unusual aspect this season is that many of the berries are whitening up already – whereas they normally stay green well into November. Why, I don’t know, but it does seem consistent with many other berries and fruits ripening earlier than usual this year. So far it’s only whitening from green, the later change from opaque white to translucent white usually only happens in December/January, so it will be interesting to see if that is early this year too. First wholesale auctions of apple orchard mistletoe are at the end of November – I’ll report then on how the plants have matured, and what prices are like. The pictures here were all taken in Gloucestershire Orchard Trust’s orchards at Longney, on the banks of the Severn just south of Gloucester, last week. The sticky mistletoe uses I mentioned last week – catching birds with mistletoe glue – seem tame compared with some of the other activities associated with Birdlime. Again, whether it really was ever made from mistletoe may be debatable – but there are certainly strong traditions. You can even buy modern versions of it, and though I doubt there’s much mistletoe in them, the name does stick (no pun intended). Here, for example is Nuovo Vischio Marrone, a tube of glue from Italy. 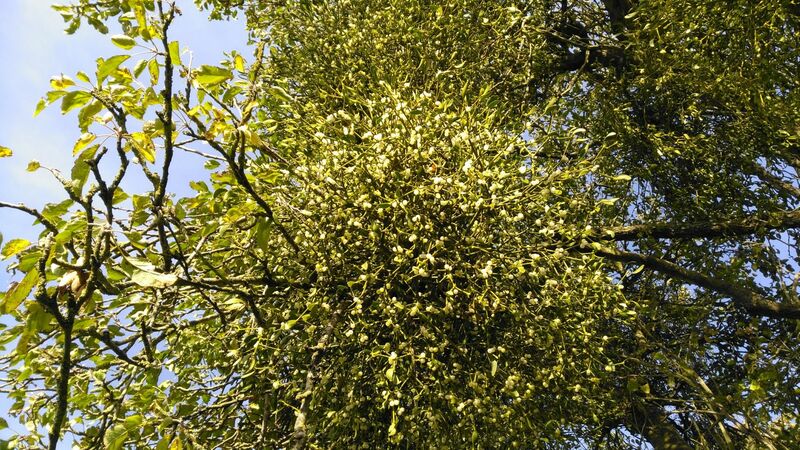 The name translates as New Brown Mistletoe Glue, and is sometimes simply translated as ‘Birdlime’. It seems to be merely an everyday glue for card and paper, nothing like the sticky trapping birdlime it derives from. Such ‘artificial’ birdlime, unrelated to the original, is quite a well-established concept. One noted British manufacturer in the mid 20th century was a firm called Kay Brothers, based in Stockport, who produced a wide range of domestic chemicals including hand-cleaners, grease removers and metal polishes. They made a version of birdlime in a tin, branded simply with their trademark K.
This played an odd, but significant, role in WW2 – when the concept of a ‘Sticky Bomb‘ to attack tanks was first discussed. The idea was that if a soldier could get close to a tank he might be able to stick some concentrated high explosive to it – which would be activated a few seconds later after the tank had moved away. The explosives part took some research – and so did finding the right glue for the sticky part. The story goes that birdlime was suggested, a tin was procured, but branded just with ‘K’ and Stockport. Inventor Stuart Macrae, working in ‘MD1’, one of the British secret gadget-making units, had to travel to Stockport to track down the firm and, having done so, recruited them to work on his sticky bomb project, developing a new glue specially for the sticky bombs. Macrae tells the story himself in his book Winston Churchill’s Toyshop (1971). The account in Wikipedia suggests that the bombs had a somewhat sticky (no pun intended) start, slow to catch on (ditto), but were successfully used in many wartime arenas. And the concept certainly caught on in popular thinking – I was recently re-reading a book from my childhood, The Otterbury Incident by Cecil Day Lewis, and was reminded that the rival schoolboy gangs in the opening chapters use (pretend) Sticky Bombs in their war games. Published in 1948, very soon after the war, this may reflect the ubiquity of the concept at the time. It would seem that mistletoe glue might, ultimately, be behind the success of the anti-tank sticky bomb – which is somewhat sobering.